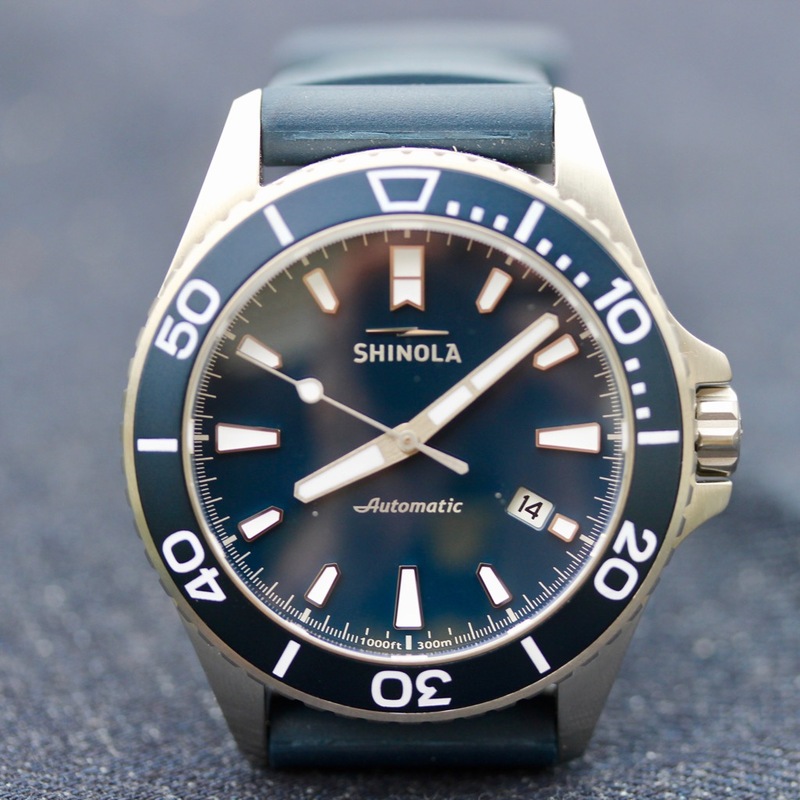 As I mentioned in our preview article on the new Shinola Monster automatics just a few days ago, we were going to be working on a hands-on review of the Shinola Lake Michigan Monster. Why the Lake Michigan? Well, for starters, it’s the lake between the town I call home (Chicago) and the one I used to call home (Detroit). Not only that, it’s in a rather lovely shade of blue as well. As you can see, an easy call to me. So, let’s get into a closer look at the Shinola Lake Michigan Monster. When it comes to Shinola, it’s a brand that’s rather divisive. Either you dig the designs and the Detroit-based story they’re crafting, or you feel like you’re being sold a song and dance. For those in the latter category, the usage of quartz movements (and quartz movements only) has only deepened that distate, even though the movements are assembled in Detroit (I’ve seen the work being done!) Obviously, that’s not the camp I find myself in, and the quartz movements never really bothered me. That said, as a watch guy, I do like a good automatic movement, and all the purpose-built machine wonderfulness it brings along for the ride. So, no, it doesn’t hurt that the Shinola Lake Michigan Monster (and the rest of the collection) feature a Swiss automatic movement. Which movement, you ask? Well, it’s a rather well-known one – the Sellita SW-200 automatic. Perhaps not as widely used, known, or pervasive as the movements from ETA, the stuff that I’ve had cross my wrist from Sellita has never disappointed me. Here, it’s a known quantity that means your watch can be serviced just about anywhere when it comes time for maintenance. For the day-to-day, this means you’ve got a reliable and accurate engine driving the date and time displays. When you pull the Shinola Lake Michigan Monster out of the box, there is no doubting that it is a dive watch. The stainless steel case measures in at a healthy 43mm by 13mm thick, and the 22mm rubber strap nestled into the lugs has the wavy expansion bits that we all know from our own dive watches (and, most likely, have never actually had to take advantage of). Add in a screw-down crown and a single-domed sapphire crystal, and it’s not that surprising that the watch carries a 300m WR rating (conforming to ISO 6425 standards, as well). Of course, all of the technical specs in the world (and the full list is down below, as usual) don’t mean a thing, especially on a dive watch, if the watch isn’t functional and legible. And, frankly, legibility is a key component of functionality. For the specific dive function, that comes in via the unidirectional bezel. The bezel itself is steel, with an aluminum insert. Normally, I’m not a fan of the aluminum inserts, but the matte finish on it here makes it look a like a much nicer material. The white-on-blue from the bezel carries to the dial, and that’s where the legibility really shines. When it comes to crisp looks, it’s hard to be a monochromatic look, and that’s precisely what’s going on here with the Shinola Lake Michigan Monster. The dial is a lovely shade of dark blue – not so dark that you can’t tell it’s blue, but dark enough to create a stark contrast between it and the large (and luminous) applied indices and handset. Additionally, the dial itself is kept very clean. You’ve got a bit of retro script on the bottom denoting that the watch is an automatic (and I do really like that font), and then you’ve got a polished Shinola lighting bolt up at the 12 o’clock position above the Shinola logo. The lighting bolt was an unexpected smaller detail that I really liked, as it gives the watch a small bit of flash in what is an otherwise fairly matte top look. On the wrist, if you’re not used to steel dive watches, you will definitely feel the 136g weight of the Shinola Lake Michigan Monster. For me, I’m used to it, and the watch quickly became comfortable, even with 43mm being at the upper limit of what I’d normally consider a comfortable case size. The rubber strap, as well, will help you keep the weight down (you can also expect that the Lake Superior version, with it’s steel bracelet, will weigh a bit more). Regardless of strap or bracelet, you’ll find that the Shinola Lake Michigan Monster is just as versatile as any dive watch. By that, I mean that these sort of sport watches work in a variety of environments. As we reviewed it, the Shinola Lake Michigan Monster on the rubber strap does present as a more casual sort of a watch, great for weekends, around the office, or even while traveling. With the polished sides on the case, though, the watch could slide into a dressier situation as well. Put it on the bracelet (or perhaps a nice leather strap) and you’ve got something that, while perhaps not quite a true dress watch, would work out quite admirably. What I’d change: The rubber strap works and fits, but I wouldn’t mind a bracelet option / add-on. Oh, and let’s color-match that date wheel too. The best thing about it: It’s a Shinola, it’s automatic, and it’s got a Chicago-Detroit tie-in. What’s not to like? Brushed stainless steel, with single dome sapphire crystal and anti-reflective coating. Midnight Blue with Super-LumiNova hands, numbers and indexes to maximize readability. SW200-1 automatic movement with Swiss and other imported parts. FUNCTIONS: Hours, minutes, seconds, date indicator. WATCH STRAP: Blue Rubber Strap.